The 2016/17 Bundesliga season may belong to the history books already, but the holiday season has not started just yet, at least not for everybody. For an array of Bundesliga stars, there are still some important FIFA World Cup 2018 qualifiers to be played, as well as the odd intriguing international friendly. Cologne forward Yuya Osako was on target for Japan, who were surprisingly held to a draw against Iraq in AFC Group B qualifying. Hertha Berlin's Genki Haraguchi also started for the visitors, who nevertheless remain on top of the standings on 17 points. South Korea suffered a setback on the road to next year's World Cup, falling to a shock defeat away to Qatar. Augsburg forward Dong-Won Ji started for the Koreans, but was substituted off early in the second half. Stuttgart goalkeeper Mitch Langerak and Hertha Berlin forward Mathew Leckie were on the losing side as Australia were comfortably beaten in Melbourne. Bayern Munich pair Rafinha and Douglas Costa started for the visitors. RB Leipzig attacker Emil Forsberg was a second-half substitute for Sweden in a friendly away to Scandinavian neighbours Norway. Chile slipped to a surprise defeat against Romania, despite the best efforts of Bayer Leverkusen's Charles Aranguiz and Bayern Munich midfielder Arturo Vidal. 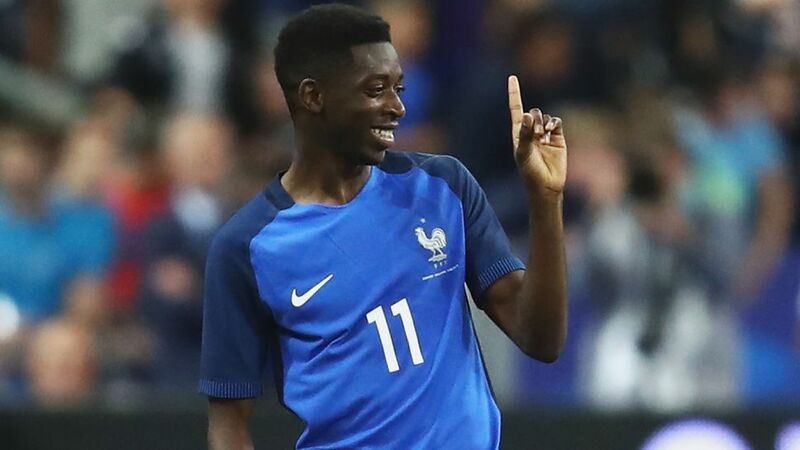 Dortmund star Ousmane Dembele played the full 90 minutes and scored the winner in Paris as the ten-man Les Bleus recorded an impressive victory over England. Javier 'Chicharito' Hernandez, Marco Fabian, Christian Pulisic and Bobby Wood all started as Mexico and the USA played out an entertaining 1-1 draw in 2018 FIFA World Cup qualifying. Mexico stay top of the standings, six points clear of Costa Rica and the USMNT. Augsburg defender Martin Hinteregger was on target for Austria in a frustrating draw in Ireland that leaves them fourth in the Group D standings, after conceding an 85th-minute equaliser. Hinteregger was one of seven Bundesliga players in the Austrian starting XI, alongside Bayern's David Alaba and Schalke's Guido Burgstaller, among others. Schalke's Yevhen Konoplyanka opened the scoring for the Ukraine, paving the way for a third victory in six Group I games. Bayer Leverkusen striker Joel Pohjanpalo netted for the hosts, while Eintracht Frankfurt's Lukas Hradecky was in goal for Finland. Bayern midfielder Thiago played 74 minutes of Spain's Group G encounter in Macedonia, helping the Iberians maintain their unbeaten record in this qualifying campaign to stay joint-top of the table with 16 points from six games. Hamburg defender Mergim Mavraj and Freiburg's Amir Abrashi were on the winning team away to an Israel side that included Ingolstadt midfielder Almog Cohen to lift Albania above their hosts and into third in Group G.
Augsburg striker Alfred Finnbogasson started for Iceland in a hugely impressive victory over a star-studded Croatia side that included Bayer Leverkusen defender Tin Jedvaj. The result pulled the islanders level on 13 points with Croatia a the top of Group I.
Dortmund teenager Emre Mor came on for the final ten minutes for Turkey in a comfortable victory that keeps their hopes of World Cup qualification alive with 11 points in Group I. Lasting the full 90 minutes, Schalke midfielder Nabil Bentaleb helped Algeria to a hard-earned 1-0 win over Togo in Group D.
It was a routine victory for the reigning world champions, with Hoffenheim forward Sandro Wagner netting a treble - his first international goals for Germany. Bayer Leverkusen attacker Julian Brandt also scored his maiden goal in a game Joachim Löw's side controlled throughout. Click here for all the action as it happened. Bayern Munich striker Robert Lewandowski also scored a hat-trick to spearhead Poland to their fifth qualifying victory, keeping them top of the Group E standings on 16 points, six ahead of closest pursuers Montenegro. RB Leipzig's Yussuf Poulsen, Gladbach's Jannik Vestergaard and Werder Bremen's Thomas Delaney all started for Denmark in a comfortable win to move onto ten points in Group E.
Werder Bremen defender Theodor Gebre Selassie was on target for Czech Republic in Norway, starting alongside Hoffenheim's Pavel Kaderabek and and Hertha Berlin's Vladimir Darida. Hertha goalkeeper Rune Jarstein played the full 90 minutes for the hosts. Hertha Berlin defender Peter Pekarik played from start to finish for Slovakia in a crucial victory away to Lithunia. The visitors remain in second place in Group F with 12 points from six games. RB Leipzig midfielder Naby Keita rounded out the scoring as Guinea came away surprise 3-2 winners against Group H rivals Cote d'Ivoire in the first round of qualifying. Borussia Dortmund's Christian Pulisic scored twice in the second-half to seal the points in Denver, Colorado. Bayer Leverkusen's Javier Hernandez and Eintracht Frankfurt's Marco Fabian were rested as Mexico eased to victory over Honduras. Bayern Munich winger Arjen Robben set the Netherlands on the way to a routine win in Group A with the opening goal in Rotterdam. The Oranje went third as a result. Hamburg's Albin Ekdal and RB Leipzig's Emil Forsberg played the full 90 as Sweden moved top of Group A on goal difference. It was a quiet night at the office for Gladbach goalkeeper Yann Sommer as a Switzerland side featuring Leverkusen's Admir Mehmedi and Hoffenheim midfielder Steven Zuber eased to victory. The win keeps Die Nati top of Group B, three points clear of Portugal. RB Leipzig goalkeeper Peter Gulasci's hopes of playing at the World Cup finals are in tatters after a shock defeat to the Faroe Islands left Hungary eight points adrift of second-placed Portugal with four games to go. Hoffenheim defender Ermin Bicakcic and Hertha Berlin striker Vedad Ibisevic lined up against Dortmund centre-back Sokratis and Augsburg left-back Kostas Stafylidis as Group H’s second- and third-placed teams played out a goalless draw in Zenica. Bayern duo Rafinha and Douglas Costa stepped off the bench in the second half, but could not spare Brazil a 1-0 defeat at the Melbourne Cricket Ground. Bayern midfield general Arturo Vidal had a header controversially disallowed as Chile were forced to settle for a draw in Moscow. Hertha Berlin new boy Mathew Leckie went the distance as Australia moved back into contention for an automatic qualifying berth with a thrilling win over Saudi Arabia. Bayern's Joshua Kimmich scored a spectacular equaliser for the world champions in Copenhagen. Bayern Munich's Arjen Robben was spot-on for the Dutch as they downed Cote d'Ivoire 5-0 in De Kuip, scoring their second from the penalty spot. Borussia Dortmund goalkeeper Roman Bürki, Borussia Mönchengladbach defender Nico Elvedi and Bayer Leverkusen forward Admir Mehmedi all started for Switzerland in their 1-0 win over Belarus - a warm-up for their FIFA World Cup 2018 qualifier against the Faroe Islands.